D.G. Mayes is the author of the Write Your First Story series of books. The books help beginning writers bring their ideas to life, and help experienced authors to expand their knowledge of fiction-craft. Mayes has a focus on generating helpful resources for the creative minded. The books can be found at writeyourfirststory.com. 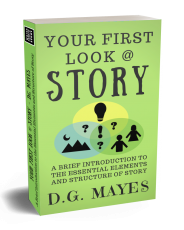 He is the author of Your First Look @ Story; it's a brief Introduction to the essential elements and structure required to craft a story. He followed that up with Write Your First Story, Write Your First Love Story, and Write Your First Ghost Story; which includes scene by scene outlining exercises that enable writers to explore their ideas. He has also written Your First Story Writing Guide; a book that helps writers develop their knowledge of story creation, assisting them with creating deep and relatable characters, crafting vibrant story worlds, and how to give readers meaningful story experiences. His future goals are to develop more of these helpful resources and fiction for those who enjoy stories, choose to learn, and love to share. This page was created in 1.4935 seconds.